Photo 2. That is exactly what we do when we install electrical facilities in heavy metal enclosures or on utility poles high above the ground. The NESC requirements for supply stations, substations and generating stations, are presented in Part 1 of the NESC starting on page 27. The NESC in Rule 123, page 34, requires all supply station exposed non-current-carrying metal parts such as structures, transformers, breakers, and switchgear to be effectively grounded or physically isolated. All fences shall be effectively grounded. 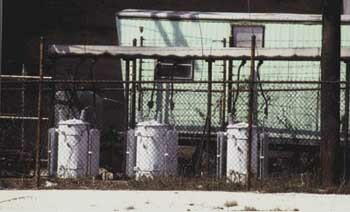 In the definitions section, page six, effectively grounded means, “Intentionally connected to earth through a ground connection or connections of sufficient low impedance and having sufficient current-carrying capacity to limit the buildup of voltages to levels below that which may result in undue hazard to persons or to connected equipment.” On page seven, isolated means “Not readily accessible to persons unless special means for access are used.” You might ask, “If effectively grounding is so expensive, why not just physically isolate everything?” That is exactly what we do when we install electrical facilities in heavy metal enclosures or on utility poles high above the ground. 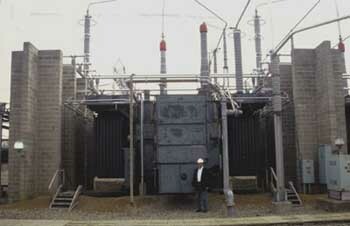 When the electrical facilities are small, physical isolation is usually more economical than trying to make the installation into a substation (see photo 2). When it is impractical to elevate equipment such as transformers the size and weight of houses, effective grounding is usually more economical (see photo 3). The grounding method shall be made in accordance with the grounding methods of Section 9. In Section 9, Rule 096A, the NESC suggests that the grounding system of a supply station may be extensive, “…consisting of multiple buried conductors, grounding electrodes, or interconnected combinations of both. Grounding systems shall be designed to limit touch, step, mesh, and transferred potentials in accordance with industry practice.” A note refers to “IEEE Std 80-2000 as one source that may be utilized to provide guidance in meeting these requirements.” In summary, the grounding system shall be designed to effectively ground all exposed non-current-carrying metal parts thus limiting the buildup of touch, step, mesh, and transferred voltage levels below that which may result in undue hazard. One way of achieving this goal is presented in IEEE Standard 80. 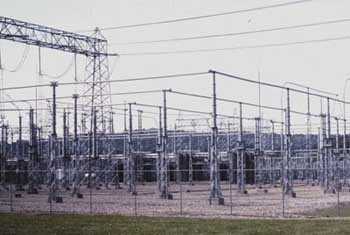 IEEE Standard 80 is titled, “IEEE Guide for Safety in AC Substation Grounding.” The intent of IEEE Standard 80 is “…to provide guidance and information pertinent to safe grounding practices in ac substation design.” One of the reasons that designing grounding systems to protect humans is a difficult task is because a critical part of the design is based upon how much current the human body can tolerate. To determine how much current the human body can tolerate, we have to make many assumptions because testing has only been performed on animals. The good news is that IEEE Standard 80 reduces this difficult problem down to 95 equations in a logical presentation that even I think I understand. In part two, we will get our feet wet in IEEE Standard 80. O Disconnect, Disconnect, wherefore art thou Disconnect?